Meet Camper van Mabel (she’s dutch). OK, maybe not but welcome to the first part of our conversion blog. 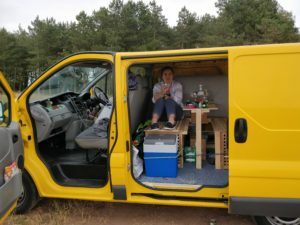 All these gin / running related shenanigans are fun, but one thing we learned early on is that 2 people can’t comfortably camp in a Fiat Doblo for long. Something bigger was needed. 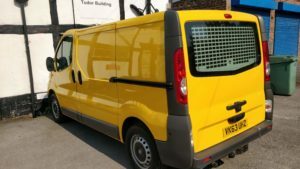 After extensive research the shortlist came down to one (when a lifting tailgate was added) and the hunt for a decent ex-AA Vauxhall Vivaro begun. After some that didn’t seem right, and missing out on a couple that did we eventually found one in Manchester and the deal was done. Checking the van over there didn’t seem to be a lot wrong with it. There was a dent in the back bumper which was sorted with a new bumper skin and a slight oil leak that was sorted with a new sump plug washer. Apart from that, everything looked good. The first job was to rip out the bulkhead and some of the AA specific bits they’d left. The bulkhead is mostly held in by Torx bolts.. with a couple of rivets just so the drill didn’t feel left out. Once the bulkhead was gone (it’s bloody heavier than it looks) it was time to think about the interior layout. Points 1 and 4 were the most pressing, and the solution to that came from that iconic name in van conversions, Ikea. 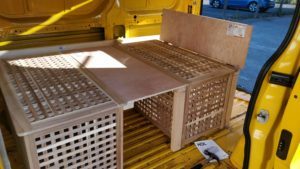 Two storage boxes would be more than enough with a table in-between, inspired by childhood caravanning memories. 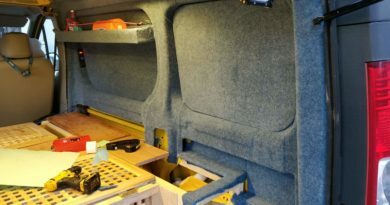 The boxes were fitted to the floor using metal brackets and self tapping screws, not exactly crash tested but not going anywhere without a considerable shunt. The table lifts up when needed and is the middle of the bed when not. At this point prior to doing anything permanent things like electrics were worked out. There’s a leisure battery under the passenger seat which powers 12v sockets and USB ports in the back to keep everything charged up. 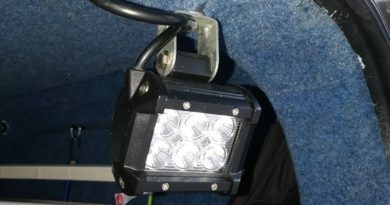 The battery also feeds the LED lights so there’s no Darin on the main battery. The existing AA floodlight pointing out the back was replaced with an LED one at this point too and all the wiring run in and connected. Not sure if the Vivaro Camper Van plans were helped or hindered by all the ex-AA stuff. Most of it was ripped out or replaced with LED lights. It seemed to make sense to start on the interior with the floor. Layers of laminate flooring underlay (the blue foam stuff) were cut into strips and glued down between the ridges in the metal floor before being covered in more blue foam and topped off with carpet tiles from B&M. the end result wasn’t bad at all, and if we do go for a new interior carpet it’ll go on top of the tiles. The existing dog guard was adapted to fit. Otherwise the big furry idiot manages to get himself wedged between the front seats and the storage boxes. This isn’t ideal for anyone. A trip to eBay scored us a folding mattress (Ikea, again) which fitted the plan and we were ready to rock. We headed off for a night away as a trial run was needed. Just to make sure everything worked, you understand. Courtesy of the Park4Night app we ended up at an awesome spot in East Lothian and gin was had. Oh, there’s also an electric coolbox for the gin and mixers obviously. Just until the Camper van Mabel gin shelf goes in.